A metal detector can be a great tool. You can go hunt for treasures on the beach or if you have an exceptionally mineralized backyard, there no saying what you might find, right! The idea of uncovering an old coin or an ancient artefact is just so fascinating. Well, if you agree, then you will love the Garrett Ace 350 metal detector. This is a state-of-the-art metal detector that has been designed with one thing in mind- precision. This premium metal detector is an edge above the competition. It has been designed to work reliably on mineralized ground and salt water. The Ace 350 is fitted with a specialized coil that is capable of withstanding salt water without even showing any signs of corrosion or damage. This is absolutely my favourite metal detector and thousands of people agree with me. 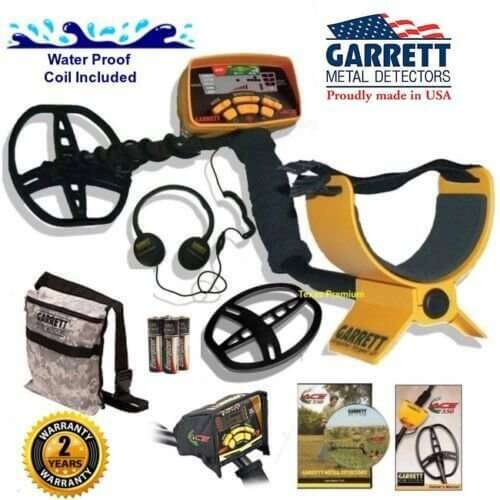 There are hundreds of Garrett Ace 350 reviews that place this detector on top of the best metal detector lists. Let’s dive right in and see what makes this product so great and why it has raked in so many positive reviews. One of the most frustrating things with ordinary metal detectors is their inability to differentiate between junk and good targets. I mean, finding junk iron pieces can be really frustrating. Well, with the Garrett Ace 350, you can eliminate this frustration and can save valuable time as well. This detector is fitted with the latest technology that is capable of distinguishing between trash and actual targets. You will never end up digging for crap anymore. The latest industry standard technology makes Garrett 350 a great detector that is as smart as you are, well almost! This is an insanely helpful feature of the new Garrett 350. Knowing the depth of your target beneath the ground is very important to any treasure hunter. You don’t want to start digging without knowing how deep your target really is. The Ace 350 is loaded with a unique continuous coin depth detector technology that gives you a fairly precise indication of the depth of your target in the ground. No more digging for hours to find nothing! Check out more reviews of the Garrett Ace 350 here! What makes Garrett Ace 350 metal detector so great? Sure, it has some good features but just having great features does not mean that they have any real-world implications. However, the features of the Garrett ace 350 metal detector translate into some awesome functionality on the field. One of the things that set this metal detector apart from the competition is how efficient it is on mineralized grounds and in salt water. The proprietary PROformance DD coil in the detector has a blunted tail and tip. This coil counters the interference from the minerals in the ground and hence is able to operate perfectly even on high mineral containing soils and saline water as well. This gives you the freedom to search the beach, land and even inside the ocean! Another thing that many metal detectors are just miserable at is finding tiny targets. Many metal detectors, even some high-end ones are not that great at finding small pieces of jewellery or coins or shell casings. However, the Ace 350 operates at a high frequency that makes the detection of even the smallest piece of metal very easy. You can find a small earring or a coin comfortably with efficiency with the Garrett Ace 350. The higher the frequency of the metal detector, the better is the accuracy of small targets. The garret 350 has an operating frequency of 8.25 kHz. At this high frequency, finding gold is much easier as well. With most of the metal detectors, you will have to purchase your own headphones. Having a good quality of headphones while hunting is a great asset. You will never miss any small faint signals if you have headphones on. The Garrett Ace 350 comes equipped with high-quality headphones to increase your chances to find something great. The high-quality headphones will not only save you some money, they will also help you uncover some good finds as well. Although this technology comes standard in many metal detectors, it is very easy to use. All you need to do is push a button. In order to make the most out of it, hold it down once you have identified the target. Once activated, the pinpointer will give you the precise location of where to start digging. Although the level of customer satisfaction is quite high in case of the Garrett Ace 350, there seems to be one complaint that keeps popping up. There is no volume control on the unit. To me, this is not that big an issue as I don’t spend long hours using this machine. However, if someone was using this machine for a long time, I can see the high volume becoming an issue. I must say that I was thoroughly impressed with the machine. The double D search coil is a great bargain and the ability to use it in water and highly mineralized land makes it a perfect companion for beach searches. If you are interested in small objects, gold nuggets and other small things, this is just perfect metal detector. If you’d like to see my review of the EXTREMELY popular garrett ace 250, we have a range of metal detector reviews here also.